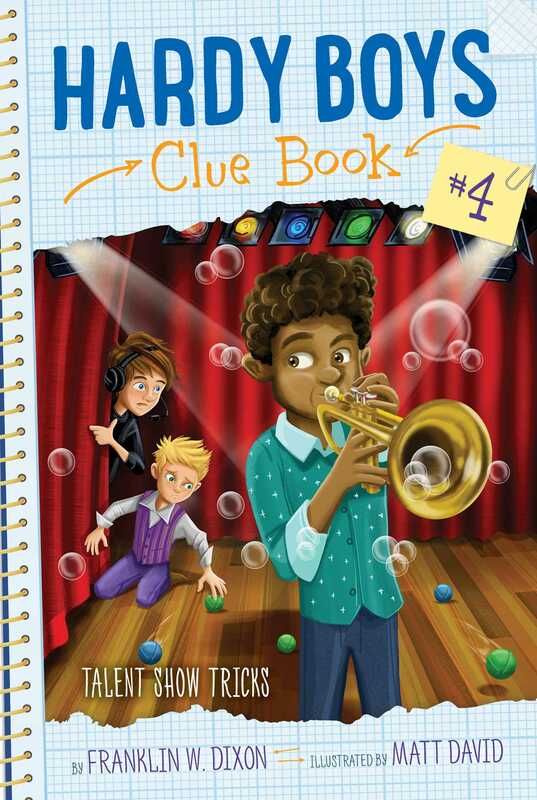 Detective brothers Frank and Joe must figure out who is sabotaging their school talent show in the fourth book in an all-new, interactive Hardy Boys chapter book mystery series. Frank and Joe Hardy are excited to compete in the annual Bayport Elementary Talent Show. Frank is going to work behind the scenes, and Joe wants to show off his sweet juggling skills. But during the first rehearsal, strange things start to happen—their friend’s trumpet is filled with bubbles, someone’s backing track is switched to croaking frogs, and a strategically placed batch of hair dye gives one of their classmates a bad hair day to remember. Can Frank and Joe figure out how to stop the pranks before the curtain falls early on the show? Nine-year-old Frank Hardy sat in the school auditorium, going over a big checklist in a binder. Frank laughed. He’d been chosen as a Bayport Backstage Buddy member for the school’s yearly talent show. That meant he was going to help with anything people needed during the show and make sure everything ran smoothly. He even had his own walkie-talkie to help him communicate with everyone around the auditorium. Mrs. Castle, the music and arts teacher who directed the show, said she picked Frank to work with her because he was so organized and reliable. He didn’t want to let her or the students in the show down! The kids in the show, including his eight-year-old brother, Joe, were in the restrooms, changing into their costumes. Rehearsal would start in just a few minutes. It was Monday, and the show was at the end of the week, so they had a lot of work to do! Frank took a few moments to check in with the rest of the BBB crew. First he talked through the walkie-talkie with Eli Ramsay, who was helping to work the lights up in a booth above the stage, and made sure he was ready to go. Then he checked on Chet, who was at the back of the auditorium. Chet was going to help with the sound—making sure each act had the right music and making sure the microphones all worked. Frank grinned. Chet was always picking up new hobbies. As he walked away from the sound booth, he grabbed the walkie-talkie that was clipped to his jeans. “Come in, Speedy,” he said. “How are things looking back there?” he asked. Speedy was also helping backstage, making sure everyone was ready to go before their act. “We’re ready to go when you are!” Speedy said. Now that he’d checked in with the crew, Frank looked around the auditorium to see if the student director had arrived yet. Olivia Shapiro was an eighth-grade drama student from Bayport Middle School, which was just down the street. At that moment, Olivia and her seventh-grade assistant, Zoe, came sweeping into the auditorium. Olivia’s face was red and both girls were out of breath. It looked like they both ran from the middle school. Plus, although it was a warm day outside, Olivia always insisted on wearing a scarf wrapped dramatically around her neck. Frank had heard her tell Zoe in a rehearsal last week that all the great directors wore scarves. Olivia took her usual seat in the auditorium with Zoe beside her. Zoe handed her a bottle of water, a notebook, and a pen while Olivia fanned herself. “Sure,” Frank said. He got Speedy on the walkie-talkie and told her to send the cast out. Slowly, students started to trickle onto the stage. Most were dressed in colorful costumes or fancy clothes. Some held props, like Joe, who was clutching the half-dozen orange balls he juggled in his act. Others carried instruments, like the new kid at Bayport, Ezra Moore, who held his violin and bow. The students stopped their chattering and turned toward their student director. The cast shook their heads. “Please feel free to see me after today’s rehearsal for more tickets if you need them,” Mrs. Castle chimed in. She was watching from the back of the auditorium. “Okay, then. You’ll remind them tonight when you get home.” Olivia clapped her hands. “Places, please!” Frank saw a few kids roll their eyes. Olivia could be pretty bossy, and not everyone liked that! The students scattered into the wings at the sides of the stage. The first and last numbers of the evening were songs that Olivia had choreographed herself, and they featured everyone in the show. Frank took his usual place in a seat behind Olivia and Zoe and got out his walkie-talkie. “Roger, boss!” Eli radioed back. The lights in the auditorium dimmed, while those on the stage brightened. “Whenever you are, Frank,” Chet replied. Frank leaned forward to tell Olivia they were ready to start, but she was deep in conversation with Zoe.